Yesterday morning, my partner clicked on an innocent-looking email attachment — and as quickly and easily as that, his computer was infected with a nasty Trojan. It could have been an expensive disaster, but a great free anti-malware tool made it easy for me to remove the malicious software from our home-office network before any harm was done, without calling in a computer tech to help. No matter how careful you try to be, malware happens. 2) a powerful anti-malware tool that can catch and remove whatever your anti-virus software doesn’t spot. Malwarebytes Anti-Malware, both lightweight and powerful, is my tool of choice for removing spyware, adware, viruses, trojans, and other malicious software. In fact, it’s the one malware-removal tool that your IT guy is most likely to pull out of his little black bag, if your computer gets struck down with a nasty bug. Download and double-click to install the software, following the on-screen prompts — it’s a standard installation wizard, and there are no confusing choices to be made here. At the end of installation, make sure sure a checkmark is placed next to both (a) Update Malwarebytes’ Anti-Malware and (b) Launch Malwarebytes’ Anti-Malware, then click “Finish”. Once the program has updated and loaded, click Scan to Perform Quick Scan (you can also do a Full Scan, your choice), and click OK when the scanning is done. You’ll want to Quick Scan regularly, and do a Full Scan from time to time as a maintenance measure. Frequency will depend on your computer usage — how much time you spend online for example, and whether something has happened to make you concerned about a possible infection — but I generally Quick Scan at least daily, and run a Full Scan at least once or twice each week. 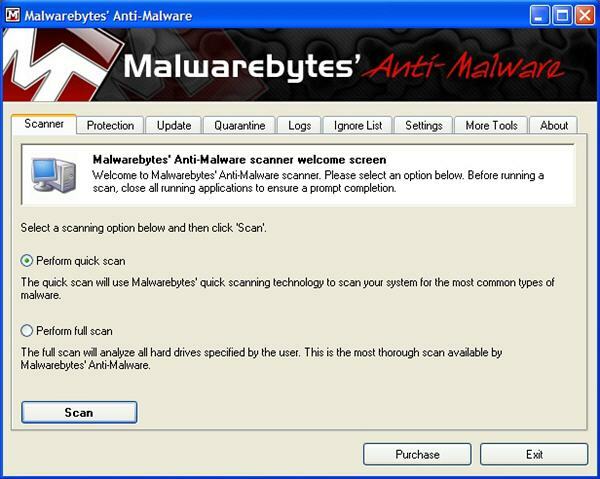 To scan a single file at any time, you can right-click on the file name and select “Scan with Malewarebytes Anti-Malware” from the pop-up menu. Updating right before you scan is vital, however, to make the most of what MBAM can do — Malwarebytes is on top of its game, with a definitions list that’s updated at least once a day, and sometimes more often. This means that new and evolving threats are almost always identified by a Malwarebytes Anti-Malware scan, where they can sometimes sneak past another program that's less frequently updated with the latest malware information. Best yet, Malwarebytes is free! More information about Malwarebytes Anti-Malware can be found at http://www.malwarebytes.org, and CNET Download.com is the “safe and trusted provider” that handles the file downloads, available at http://www.malwarebytes.org/mbam-download.php. I have to tell you, I was pretty darned happy to have it on hand yesterday! And if there's a possibility of saving your organization the cost of tech fees, lost time, and lost data by adding Malwarebytes to your Internet security toolbox, why not give it a try? Do you have a favorite malware-removal tool to recommend — or a computer-infection horror story you'd like to share? The comments are open! I've used Malware Bytes for a long time now, first to clean up an infection last year (successfully) and then to monitor and catch security issues. I bought three licenses and highly recommend this software. I was saved by that program once. All the links from google were wrong from some trojan. That program seriously saved me. I was lucky to have another computer so I could actually do some searching to find it. The trojan I had also didn't allow it to install, so I had to change the name of the install file. Now, that computer is always on my Windows system. Excellent point, Adam - some Trojans will prevent anti-malware tools from updating or running. I like to "Save As" to rename the install file to something random right when I first download; that way, the malicious software can't find it. Doesn't matter what you rename the file, as long as it's different from the original. Ah, don't forget the wonderful free Antivirus Avast, by Alwil. I prefer it to AVG. Even in its free form it's great. It just caught another trojan from the fake facebook emails I've been getting. And thanks for writing about Malwarebytes. I had to use it once when my oldest son's computer got infected with the nasty Windows XP Antivirus. It worked like a charm.